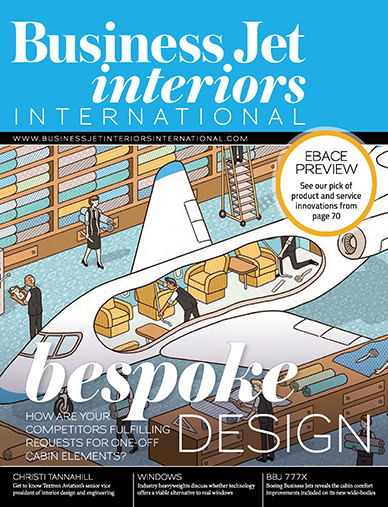 Download the Business Jet Interiors App NOW to read the latest issue! The App is free and gives you access to a library of back issues. Cover story – Bespoke design: How equipped are OEMs, designers and cabin outfitters to deal with requests for truly different interior elements? Design innovation: As part of this issue’s focus on bespoke design, three top designers reveal the work that goes into creating innovative cabin elements. Swiss Air-Rescue Rega: For its new Challenger 650 air ambulance fleet, Swiss Air-Rescue Rega required a one-off design with lots of bespoke elements. Windows: Aircraft manufacturers are continually making windows larger. Could virtual windows provide an easier alternative? Christi Tannahill: Textron Aviation’s senior vice president of interior design and engineering talks up the benefits of quietening down and listening to what the customer really, really wants. BBJ 777X: Customers will be able to commission fully bespoke cabins for Boeing Business Jets’ long-legged new wide-body aircraft, as well as enjoy many built-in comforts. EBACE Preview: Some of the product and service highlights to seek out at this year’s show, to be held in Geneva, Switzerland, on May 21-23, 2019. Pinboard: The industry’s hottest recent designs presented in one place. Interior Update: Embraer’s service center in Sorocaba details its first full renovation of a Legacy 600 cabin. Completions Roundup: This quarter’s announcements from completion centers around the world. Design Brief: An organic-looking design for the BBJ Max 7, designed by SkyStyle and visualized by KiPcreating, in collaboration with Boeing Business Jets. Design Spy: The best designs from other sectors, including one to make you look at concrete afresh.